Home Expert Advice Skincare Advice Eye Care Eyelash Extensions Pros & Cons - Are They Right for You? Eyelash extensions can be a beautiful, albeit expensive, way to enhance your natural eyelashes without mascara or strip false lashes. These individually applied lashes can look surprisingly natural! With the exception of the expense and the appointment time, it means waking up each morning looking fabulous. Other than the doctor-prescribed Latisse®, most cosmetic products claiming to grow lashes don’t work. And although there are great mascaras, they rarely, if ever, perform like the ads say they will (just look a little closer, the women in almost every mascara ad have false eyelashes on!). Paula became intrigued when she saw a friend of hers wearing these extensions, and had to try it for herself. We explain the pros and cons she experienced so you can decide for yourself if lash extensions are for you. Lash extensions are individually applied synthetic or natural hair fibers attached to the base of each eyelash with surgical glue. Each fake lash is applied one by one (it's a painstaking, time-consuming process) to your own eyelashes. If you are very, very careful in how you take care of your eye area after having lash extensions applied, and have touchups every two to three weeks, your lash extensions can hold up pretty well. But straying from the guidelines can cause a mess, with the lashes coming off sooner than they would have otherwise. Subsequent appointments after your initial application is mandatory for maintenance. How often you need a "fill" depends on your own natural eyelash growth cycle and on how well you take care of your lashes. Taking care of your lash extensions is a big deal! Research your lash professional. It's best if your lash technician is professionally certified and trained in an established method of application. Don't be embarrassed to ask about credentials; the best ones will be proud to show you their work! Choose your look carefully, just the way you choose a hairstyle by looking at pictures. Most lash technicians will walk you through this. There's a fine line between gorgeous, fluttery lashes and spidery, obviously fake-looking lashes. Understand there are potential risks although they're rare. The most common complaints about lash extensions are allergic reactions to the glue, eye infections from contact with unsanitary tools, or an infected follicle from two lashes being glued together, and/or from the glue itself clogging a hair follicle. Understand the process. Applying a full set of new lashes can take anywhere from 90 to 180 minutes. 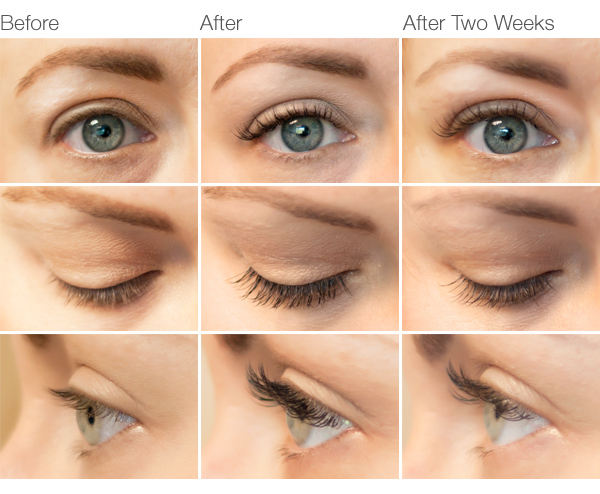 Depending on the look you want to achieve, anywhere from 60–120 individual lashes will be applied to each eye. To prepare the eye area for extensions, your lash technician should be taping your lower lashes down to your skin, and placing hydrating eye pads on top. This is done to prevent the glue from getting on the lower part of your eye as lashes are applied. They look fabulous. More dramatic than mascara, yet far more natural than a strip of (or individual) false eyelashes, lash extensions are simply stunning when done right. They're instantly gratifying. Lash extensions deliver the gorgeous lashes you want with one appointment, and you won't have to bother applying and removing mascara every day, or worry about mascara flaking, running, or smearing. They can save you time. Some people say that because lash extensions look just as good if you aren't wearing makeup, you can forego this time-consuming step in the morning. We're not convinced about this as you still have to find the time twice a month to get the extensions filled in, so it more or less evens out. They can last for months and beyond! Typically, lash extensions stay looking good for 2 to 3 weeks, but beyond that, all of them will gradually fall out on their own. However, with regular fills, your overall lash extensions will last indefinitely. They're expensive. Expect to spend anywhere from $150 to $500 (yes, that much) for your first full set of lashes. From there, refills (typically needed every 2–3 weeks) cost $50–$100 per visit. If you do the math, that's anywhere from $1000 to $2500 per year spent on lashes! They're high maintenance. Your lashes will need extra attention to look good between fills because preserving these expensive additions to your eyes should be the goal. Do not use oil-based cleansers and makeup removers as they cause the glue to breakdown. Avoid using mascara over them because removing it can snag the extensions, causing them to fall out prematurely. You must be careful when washing your eye area as any movement of your lashes will increase the lash falling out or getting twisted around. Do not let water from the shower fall directly on your face as the pressure will make the lash extension loosen and shed faster. Do not rub your face with a towel or press your face too hard into the pillow when you sleep. Use a dry mascara wand (your lash technician will give you one) at least once a day in the morning or several times during the day, as needed, to comb through your lashes and gently straighten them out, especially if they get wet. Careful! If you tug to much they'll loosen and fall out. The extensions easily get twisted around from sleeping positions and after washing your face and they can start looking really odd. Be careful how you apply makeup. Avoid oil-based skincare products around the eyes as well as greasy eye pencils and concealers as they will breakdown the eyelash glue. Also avoid applying heavy eyeliner as removing it tugs at the lashes, resulting in more fallout. Use a cotton swab dipped in makeup remover to take off makeup at your lash line. The more dramatic the lash, meaning thicker, the more likely it is to get twisted and fall out earlier than you want. Lash extensions can be worth the money, but they're definitely not for everyone. It really comes down to your budget, time allotment, and compliance with the guidelines as these aren't easy to maintain. Following our advice will help increase your chances of getting great results.